Art by Shano: Illustration Friday "Sea"
So, a few months and many hours later, I have digitally reconstructed the image. (I still had the low resolution image with the copyrights all over it.) A special thanks to Illustration Friday for making me take the time to save her. But the good news is that she can be purchased as a print (without the copyrights over the image!) here. beautiful like all your work. It is horrifying when you loose good work but i´m happy to get see this one. so flowing and fun! i am glad you saved her life! Very pretty mermaid. I love the rich colors. 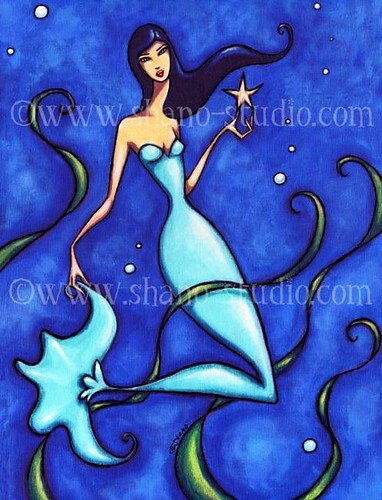 This mermaid has everything blue; she's very pretty and cool! You have a great, flowing style. This is a beautiful piece. Shano, this is gorgeous! The colors are totally DREAMY!